Shyloe wants to be a good citizen and she believes we should all re-cycle. 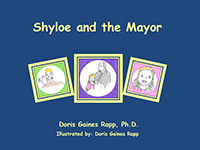 Read Shyloe and the Mayor and find out what happens when she meets the mayor. Available at amazon.com and barnesandnoble.com. Read on! Doris Gaines Rapp ... is an Indiana author and an Ohio transplant. She took a six year detour into New Mexico. Writer by birth, psychologist (PhD in Counseling Psychology) and teacher by education and experience, she is a former counseling center director at Taylor University, Upland and Bethel College, Mishawaka, IN. Not for writing background, but for fun, she was even the lead psychologist at a men’s prison for a month. Rapp is passionate about people and understands the characters she creates. She has taught grades first through third and found the students to be funny little creatures. Teaching seventh-grade and the special education resource room in a high school were experiences that broadened her understanding of teens. Undergrad and graduate school psychology classes informed her concept of the wide variety of young adults. Private practice put her in the heads of people age three to eighty-three. She has also edited a few doctoral dissertations. Rapp has led professional continuing education seminars for psychologists and currently presents Promote Yourself at Write Now! – A Seminar for Writers. 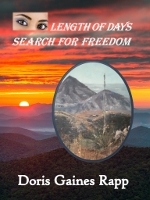 Proud to be an indie author, Dr. Rapp has written eight novels and is writing the ninth. As the wife of a pastor, she and her husband, Bill, have six grown children and live in Indiana. She writes full time. "Please spend time with me and my characters." Doris Gaines Rapp ____________________________________________________________________________________________________________________ www.prayertherapyrapp.blogspot.com. Use the links provided.